Bookmarks: Infiltrating the Library System's aim is to get more people to appreciate work in the format of the artist's book, and give book artists the opportunity to network. The Bookmarks series of international artworks has been running annually since 2004. It has visited 83 venues in Italy, The Netherlands, the UK, Ireland, France, Denmark, Germany, Poland, Singapore, Turkey, New Zealand, Canada, Brazil, South Korea, Cyprus, Croatia, New Zealand, Japan, Australia and the USA. Over 280 artists have contributed more than 28,000 bookmarks to the projects to date. Sarah Bodman from University of West of England is the instigator of this project. Artists who work in the book format, each produce an edition of 100 bookmarks, which are collated into sets, with one full set sent to each artist, the rest go to galleries, bookstores and libraries for distribution. Each bookmark is archived in the gallery section of the Bookmarks website, with the artist’s details. Books are an unknown adventure before they are read - an uncharted journey. 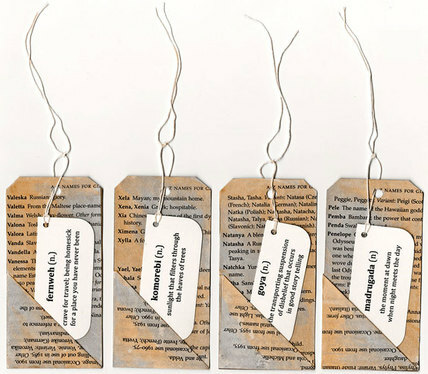 I chose luggage labels because they represent travel or a journey, there are six layers to each mini collage bookmark. Books and journeys are in layers, some are smooth and comfortable, others are rugged and full of hairpin bends! The first layer is from a map of England, representing travel/journey/adventure. I have stamped each one like a passport, with the message ‘bon voyage’ - the wish for a good journey/adventure or a good read. Words are all around us, we read just about anything and everything we see. 'Snippets' is about the fragments of text we read every day. For instance, when we travel by train our eyes are drawn to other peoples' reading material, whether it is their book, a newspaper or even handwritten notes, we scan the words to find something that interests us. Snippets is a collage made up of several layers of 'found' text torn from discarded books which I have enhanced with stains and glazes. Again I have used the humble shipping tag as the carrier for my bookmark this year - to me shipping tags represent journeys. This journey is to remind us of the long way we have come since we were children learning our alphabet - to the place where we can become totally ‘lost’ whilst reading a book. alpha-beta is made up of five different layers, the first was made from a wooden letter loaded gesso and stamped onto the tag to give a textural quality, subsequent layers of dry brushed acrylic paint were built up in cobalt and ochre. The final layer having copper interference paint added to enhance the depth with an iridescent look. containers housing interesting, usually organic, items displayed for personal satisfaction, or scientific studies. These bookmarks hold a collection from my own 'English Country Garden' - a pressed flower, a young leaf, and a tiny white dove. These three items are 'housed' within a framework of waxed gesso, to give the impression of an old cabinet. 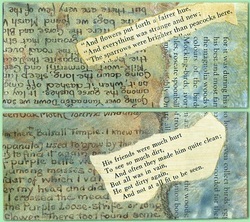 For these collaged bookmarks I continued with a theme I was exploring during my Masters Degree. At an auction I had bought ten wooden boards that had once been the dividing wall of an old cottage, many layers of wallpaper had been revealed when the wall was pulled down, exposing over 100 years of history. What could these walls tell us? What stories and dramas had they seen? The original boards formed the backdrop for my major project, ‘The Seamstress’ which told the heart-breaking story of Ivy Sparrow. Please refer to my website for further information. The title, ‘Yellow W﻿allpaper’ is taken from a personal favourite piece of Victorian G﻿othic literature written by Charlotte Perkins Gilman. Kizzy and Nuri are two fictional characters that have been ‘born’ from my personal collection of antique and vintage Romany postcards; their lives have been richly woven into a sumptuous visual narrative. As usual I have used luggage lables for my mixed media book marks - this signifies the adventurous journey we set out on each time we pick up a book. ​This bookmark is made up of fifteen individual layers to convey the subtle complexities in a good story. There is a theory that doodling keeps you focused: when you doodle, you don't daydream. I created one large sheet of paper, covered in circles cut from an old book. After adding lots of colour I doodled around each circle, then cut the page into 100 squares, sticking one on each tag. Lastly I expanded the doodles out of the box and onto the tag itself to signify the way our minds work trying to guess what happens next in a story, and therefore creating many new scenarios. Once again my bookmark is a luggage label, to signify travel. This year the journey I have taken is that of Slow Stitch, in particularly I am exploring the Japanese tradition of Boro. The Slow Movement encourages us to take the time to slow down in our busy lives, to submerge ourselves in something that takes time to complete - giving us the opportunity to contemplate and meditate. Boro is literally translated as tattered rags or scraps of cloth - it is the functional technique used to patch and repair timeworn garments, often with tiny running stitches to secure and strengthen. ​My most recent art project, ‘The Grandmother Clock’, involved me altering twelve little books. 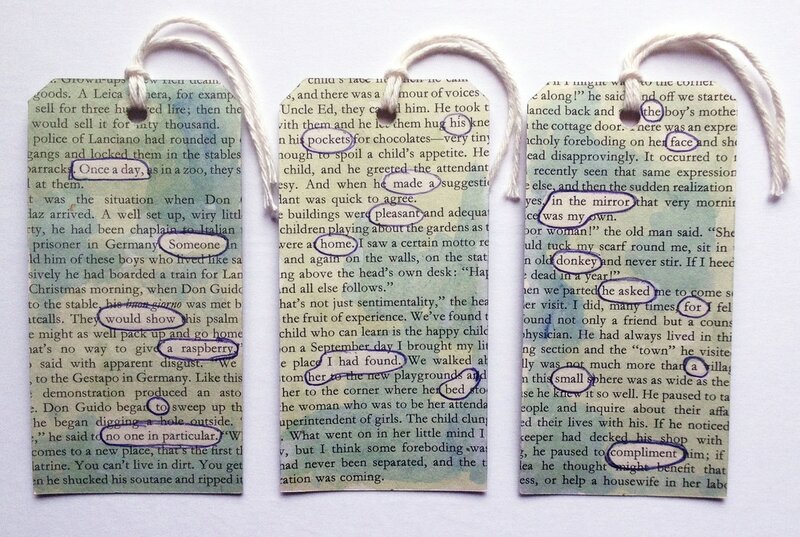 This left me with lots of unused book pages, some of which I attached to luggage labels for the book mark 15 project. ​‘once a day, someone would show a raspberry to no one in particular’ or ‘the face in the mirror was my donkey he asked for a small compliment’. I have used this process (which I refer to as ‘chronological extraction’) several times in the past when creating some of my assemblages such as ‘Dwelling of the Muses’ and ‘Whimsical Jumbles’. And so the BookMarks, Infiltrating the World project comes to a close with it's fifteenth and final year - I am proud to have taken part in ten of them. I missed the first three as I had not heard of the project until the fourth year. In 2010 the project was extended to librarians only, and 2011 I had to pull out at the last moment as I was in the final throws of creating the major project for my Masters Degree.